Van Hoogstraten became an official Master and Painter when he finished his apprenticeship at the studio of Rembrandt. Almost right after his training under Rembrandt, Van Hoogstraten started on his own, primarily doing portraits. Later he became an architecture painter and honed his skills in linear perspective. He traveled numerous times in various places in Europe throughout his career and spent considerable time in Rome, Vienna and London but his base remained in his hometown in Dordrecht. In most of his preserved works, it could be seen that Van Hoogstraten experimented in various genres and styles at different periods of his career. In a portrait he did in 1645, there were traces of Rembrandt’s style. 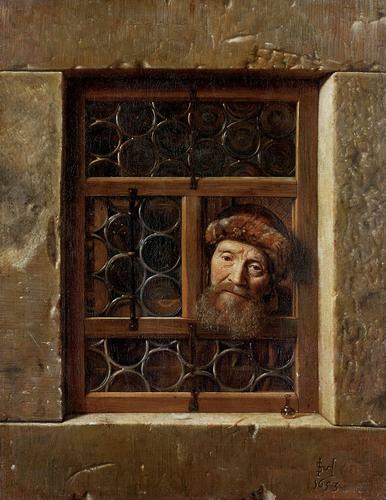 He continued to do that until 1653 when he painted a bearded man looking out a window. His other portraits include “Portrait of Johan Cornelisz,” “Vijgeboom and His Wife” and “The Anaemic Lady.” Some of his sitters were wealthy members of Dutch society, as evidenced by other paintings and luxurious furnishings. His 1670 painting of “Two Women by a Cradle” showed the chiaroscuro effects he learned from his teacher, Rembrandt and his fine brushwork. 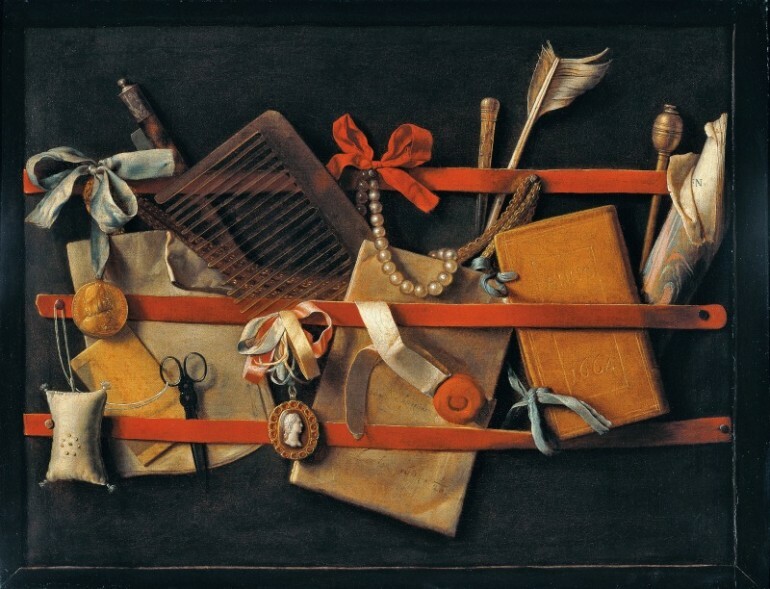 Van Hoogstraten was quite skillful in tromp-l’oeil still lifes, disguising the deeper meanings beneath haphazard objects. Van Hoogstraten was also a skilled engraver and etcher and had created several plates that have been preserved, including his portrait, which he engraved himself when he was already 50 years old. Van Hoogstraten best displayed his skill in using linear perspective with his “perspective boxes” or “peepshows.” One of these was called “A Peepshow with Views of the Interior of a Dutch House” where the painting showed 3D views of a Dutch house’s interior convincingly, in the manner of one looking inside the house through a peephole. For his skill in architectural perspective paintings, one of the best examples is the “View Down the Corridor” that he painted in 1662. Peepshows were popular in the 1600s in his native country and he did several of this. A peepshow is a rectangular wooden box, painted on three sides, usually depicting the interior of a Dutch house. Light would come in from the side, in some cases by using paper that had been specially treated. It is places near a light source, such as a candle or a window. On each short side of the box is a peep hole and when a viewer looks through, it will give the impression of looking though a 3D view of a house’s interior. One of the surviving peepshow box of Van Hoogstraten, displayed at the National Gallery is quite captivating. Although Van Hoogstraten was known for his paintings, he achieved higher fame through his literary pursuits. In 1678, his treatise was published. It was entitled “Introduction to the Advance School of Painting: The Visible World (Inleyding tot de hooge schoole der schilderkonst: anders de zichtbaere werelt). It was an ambitious work that dealt with his moral views in relation to philosophy and painting, several pictorial discussions with references from antiquarian and modern authors. It had various references to the teachings and views of his teacher, Rembrandt. It was an important contribution to the history of art and a good reference material. He taught several students, including Godfried Schalcken, Cornelis van der Meulen, Aert de Gelder and Jan van Hoogstraten, his younger brother. Arnold Houbraken, another of his many students, wrote a book entitled “The Great Theatre of Dutch Painters.” In it was the biography of Samuel Dirksz van Hoogstraten, which became an invaluable source of information on one of Dutch Golden Age’s significant painters.